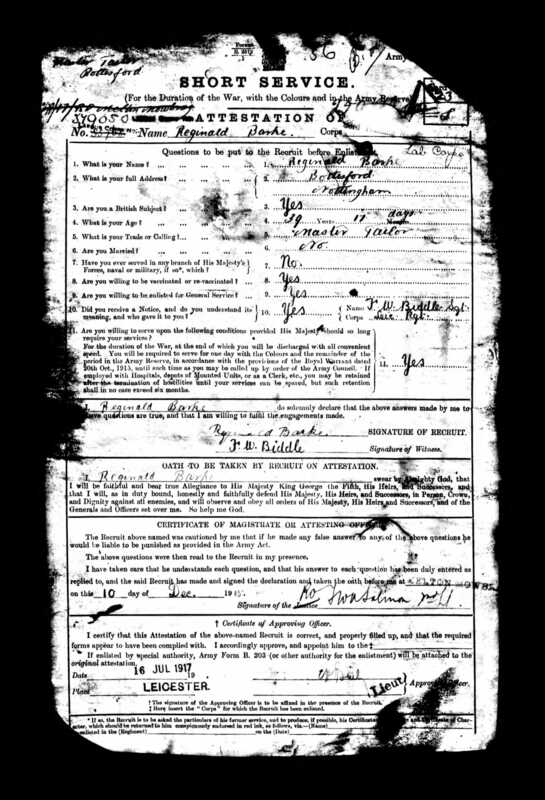 Reginald Barke's Attestation Paper from 1915, revised in 1917 when was actually called up. Reginald Barke was born on the 23rd November, 1877, at Stathern, near Melton Mowbray, son of platelayer Matthew Barke (born in Stathern in 1845) and his wife Sarah (nee Hornbuckle), who was also born in Stathern. His parents had married in 1876, and he was their first child. In 1891 Reginald was a schoolboy at Stathern village school and his father Matthew was employed as an ironstone ganger. The family lived at the top of the village in Stathern. 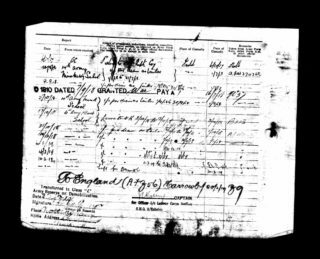 By the Census of 1901 Reginald had served his apprencticeship and become a journeyman tailor, boarding at the home of a master tailor named Fred Miller on Skyner Street near the Forest, Nottingham. A link for this position may have been that although Fred Miller was from Boston, his wife Elizabeth was born in Harby, near to Stathern. In 1911 he was boarding at the Coffee House on Market Street, Bottesford, where the keeper was John Hardy, a joiner. This had been established during the 19th Century by Lady Adeliza Norman, wife the Rector Frederick Norman, and was also known as a Temperance Hotel. Reginald Barke had worked his apprenticeship and was now a master tailor. He worked in Bottesford for many years before and after WW1, being listed in Kelly’s Directory in 1908, 1912, 1916, 1925, 1928, 1936 and 1941. Mentions in the Grantham Journal provide glimpses of Reg Barke during the period before he joined up in 1917. In April 1914, at Belvoir Petty Sessions, he was sworn in as one of four Parish Constables in Bottesford (Grantham Journal, 11th April 1914), and was re-appointed the following year (Grantham Journal, 3rd April 1915). The Grantham Journal also reported, on 16th September 1916, that GW Goulding, Auctioneers, were to auction two dwellings on the corner of High St and Queen St, Bottesford, one of which was occupied at that time by Reginald Barke. Presumably this was the house he returned to in 1919 after being discharged. A fourth mention was made in the Journal of the 7th July, 1917, which states that Herbert Scott was to sell by auction on July 10th “a quantity of useful household furniture” and “a wooden fowl place” belonging to Reginald Barke, who was joining the forces. 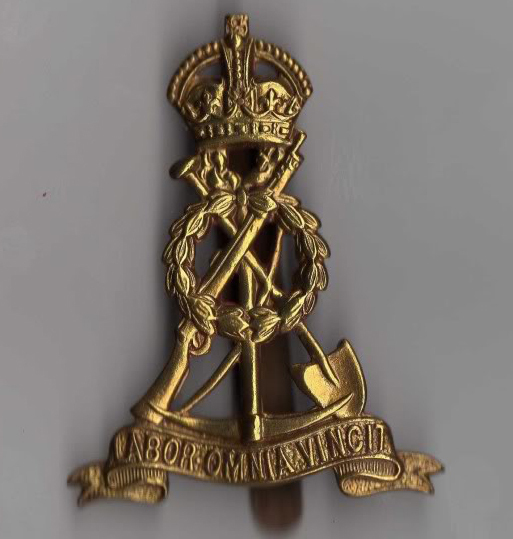 Family tragedy struck when his widowed mother, Sarah Barke, died in Stathern on the 16th December, 1917, just six days after Reginald had joined the Training Reserve. 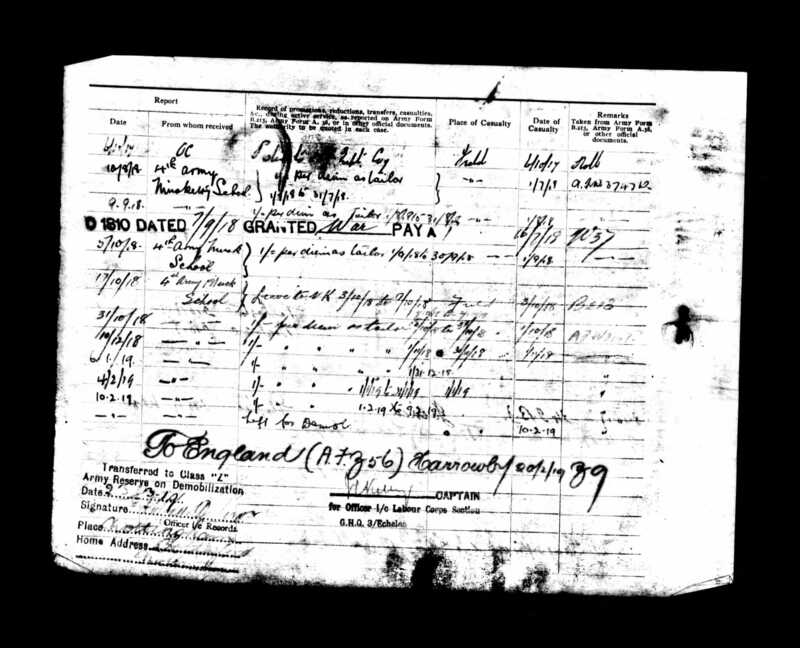 Reginald Barke first attested on the 10th December, 1915, a master tailor, 39 years and 17 days old, intended to be posted to the Durham Light Infantry, service number 55765. 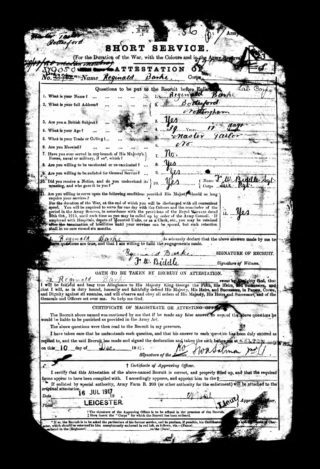 However, he was not mobilised immediately possibly because of his age, and had to wait until the 16th July, 1917, when his attestation paper was revised and his service with the armed forces was deemed to have commenced, for pay and pension purposes. When mobilised he was already 40 years old, making him perhaps the oldest man to enlist from Bottesford. 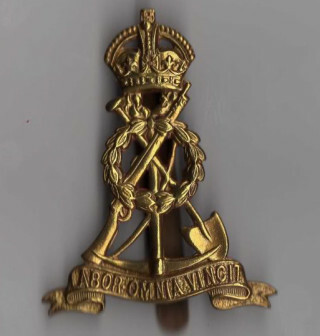 He was now 379050 Private, posted initially to the 83rd Training Reserve, Labour Corps. He arrived at Etaples on the 3rd October and joined the 359th Company Labour Corps on the 9th of October. It is unclear what he was required to do immediately thereafter, though he was classified as a master tailor. Clearly his fighting skills needed improvement, as we find that he was at Musketry School from the 1st to the 31st July, 1918. His Protection and Identity Certificate specifies the 4th Army Rifle Training School, Etaples. His records indicate that he suffered bronchial catarrh, but was not seriously ill or injured. He remained at the Army Training School until the end of the war, presumably undertaking necessary tailoring work as well as musketry training. Early in 1919 he left France and arrived at Harrowby Camp, Grantham, on the 20th February, 1919, before his final transfer to Z-Corps and discharge at Nottingham on the 23rd March 1919. In 1919, on his return from the army, Reginald Barke lived on High Street, Bottesford (believed to have been at what is today no.4). He had married Alice Hallam, daughter of Mr and Mrs F Hallam, at Bottesford, on the 10th October 1918, while still in the army. He returned to his trade of tailoring, gaining high repute and produced clothing for the Belvoir Hunt. He was the caretaker of the Coffee House from 1919 until 1943, when he died. Interestingly, his wife was on the electoral rolls, at Market Street (the Coffee House), from 1921 to 1925, but Reg was not listed, though he had been added by 1927. Whatever the reason, it is known that it was at the Coffee House that he carried on his tailoring business. Villagers recall that he could be seen sitting cross legged in the window. 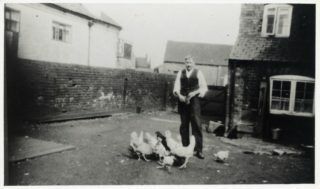 A photograph, taken in 1942, shows him in the yard behind the Coffee House, feeding chickens. However, at one time the Barkes lived at No.4, High Street. The National Register of 1939 records Reg and Alice living on Market Street, presumably the Coffee House, with their daughter Elizabeth Gwendoline Musson, born 8th August 1920, and Henrietta George (b.28/12/1891). Reginald Barke died on the 15th September, 1943, aged 66, and his wife Alice on the 2nd October, 1970, aged 86. They share a grave and headstone in the churchyard at St Mary’s, Bottesford.